I hope everyone had an opportunity to enjoy a restful and refreshing break sometime over the summer and that you are ready to begin the fall 2016 semester with energy and enthusiasm to match that of our new students. As has been the case for the past three summers, our students and those of you who left campus for the summer are returning to city streets and a campus marked by construction all around us, cone zones, and detour signs. Although the construction is causing temporary inconvenience for everyone, the campus-wide improvements in our physical work environment are needed and welcomed. Enhancement of our campus facilities and landscape are key elements in attracting the best and brightest students and providing a more functional and pleasant work space for faculty and staff. Within the college, construction of the Ken and Blaire Mossman building is coming along well and remarkable progress has been made on the construction of Strong Hall. In fact, representatives of the future occupants of Strong Hall have been touring the building in recent weeks. By the end of this month we expect to have a refined update on the schedule for holding classes in that building and the phased moving of the designated departments. We eagerly anticipate beginning the fall 2017 semester with undergraduate biology and chemistry courses housed in new state-of-the-art teaching environments. On a smaller scale, the Department of Ecology and Evolutionary Biology will benefit from a small greenhouse that is being added to the existing ones at Senter Hall. That project is almost finished. In addition to the improvements in the landscape and facilities, the arrival of a new class of very bright students, and pay raises again this year, we have more good news and reason to celebrate. We have made great faculty hires this year! Seventeen of our twenty-one departments will welcome a total of twenty-nine new faculty colleagues as they join the college family for the first day of classes this week, enriching the intellectual capacity and enhancing the diversity of our college. The announcement of the talents and qualifications of the new freshman class promise that faculty will have another group of bright and talented students to teach and to challenge us. 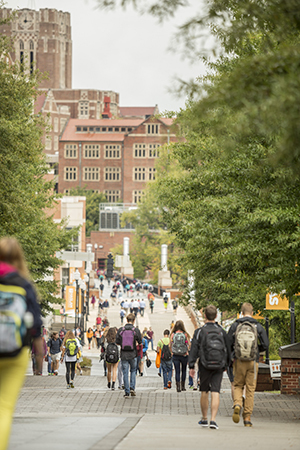 UT Knoxville has had another record-setting year of freshmen enrollment. With 4,825 incoming freshmen, the Class of 2020 is the largest in at least thirty years, and marks the sixth consecutive year of freshman growth. The credentials of the Class of 2020 continue the university’s decade record of attracting a freshman class that gets better each year. This year’s freshmen have an average ACT score of twenty-seven and an average high school GPA of 3.89. Forty-nine percent had high school GPAs over 4.0. About ten percent of the freshmen are enrolled in UT Honors programs. We also continue to see growth in our out-of-state undergraduate population, now expected to be seventeen percent. The size of the increase is a bit more than expected. As a result, most of our first year class sections are full, and in some cases there are long wait lists. In addition, we expect an increased number of transfer students which may put some pressure on upper level courses as well. Please be patient as the various departments, faculty, advisors, and administrators deal with last minute changes to try to accommodate students as well as is possible. I also want you to be aware that the housing situation has not resolved as expected: one new dorm is not opening on time and a large private apartment building designed for students, and already rented, is not opening on time. Consequently, during the first weeks of class some students are going to be particularly stressed. There is, however, some good news for commuting students (and faculty and staff) because there are additional parking options on campus this year. Even as we celebrate our successes, we are launching the new semester facing challenges. At the campus level several members of our seasoned campus leadership team have decided to retire or seek positions at another university, resulting in interim appointments in a number of key campus leadership positions, and a year ahead of searching to fill the vacancies. These personnel changes could potentially dampen morale and stall our momentum of advancement toward the college’s goals. We cannot allow this to happen. Our campus leadership has provided a clear vision for our journey to the Top 25 and we have made steady and remarkable progress on that journey. Our updated campus strategic plans are our roadmap to continue the journey and maintain our pace as we work together to achieve the goals we have set for the college. In the coming year, we will review our strategic plans in both the college and departments to align them with the campus plan. Chancellor Cheek will continue leading our campus until a new chancellor is appointed with strong support from his cabinet (both continuing and interim appointees). I call on you to join me in renewing our enthusiasm and energy for advancing the college. As we begin this academic year, we will also be dealing with the unfinished business of the legislature’s defunding of the university’s diversity office. We must continue to work together to find ways to make progress on the broadly and deeply embedded diversity goals in our strategic plans, to nurture and sustain a welcoming environment for all of our students, and to honor our responsibility for preparing our students to live and pursue careers in a global community. Fortunately, the Faculty Senate, the Division of Student Life, the colleges, and many faculty and staff members are contributing to the efforts to develop sustaining supportive programming for diversity and inclusion for students, faculty, and staff during the coming year. In our classes, we need to be mindful of the emotional distress many of our students are experiencing as they process and seek to understand the proliferation of intolerance, violence, and terrorism in our communities near and far, both within the United States and abroad. Social unrest in our own country is at the highest level in recent years and in the lifetime of most of our students. Moreover, we are engaged in one of the most contentious presidential elections in our country’s history and the rhetoric is shrill and divisive. As appropriate for class goals, consider providing students opportunities to write and talk about issues of concern to them, encouraging them to employ the intellectual tool honed by our curriculum—critical thinking—to think clearly and rationally about what to do or what to believe, systematically evaluating their own values, attitudes, and perspectives, and those of others. In other sections of this newsletter you will read about the college’s third annual celebration of staff last May, including the presentation of staff awards. You’ll also read about new faces in the college office and leadership appointments at the department level, and more. I hope you will take time to catch up on the college news. I always welcome your thoughts about any topic on your mind and invite you to write to me at artscidean@utk.edu. Please feel free to suggest topics you would like me or others in my office to address in future issues of Dialogue. Thank you for all you have done and continue to do to advance our college. Have a wonderful semester!